Fire-Belly Toad | Zoo Med Laboratories, Inc.
Fire Belly Toads will do best in a semi-aquatic terrarium. Terrariums with half land and half water provide the perfect environment for Fire Belly Toads. 2 or 3 Fire Belly Toads will do well in a 10 or 15 gallon terrarium. Larger groups will need a 20 gallon or larger terrarium. Zoo Med’s ReptiHabitat™ or Naturalistic Terrariums are ideal for setting up the proper habitat. A Waterfall Kit™ is a great addition to a Fire Belly Toad terrarium because it will help keep water from becoming stagnant and will add a naturalistic look to your pet’s home. Zoo Med’s Black Silicone Rubber will allow you to build custom terrarium features with a water element that will suit all your frog’s needs. No Basking Site is needed. Fire Belly Toads are cold tolerant amphibians, and will do best with little to no supplemental heat in most homes. A quality Zoo Med Thermometer will enable you to monitor your terrarium temperatures. Like most amphibians, Fire Belly Toads do not require special UVB lighting, however proper light cycles will encourage normal daytime behavior. Fire Belly Toads do well with a day and night light cycle (photoperiod). This can be accomplished by using Zoo Med’s NatureSun® linear fluorescent lamp. Eco Earth® is the preferred substrate for most amphibian species. We recommend keeping a deep layer of 2″ or more to allow your frog to burrow completely under the substrate. We recommend using ReptiSand™ as a substrate in the water element of your terrarium. Avoid using large gravel in your terrarium. Fire Belly Toads can be aggressive feeders and will experience impaction if they were to swallow gravel. Zoo Med’s Terrarium Moss, Frog Moss, and New Zealand Sphagnum Moss are excellent choices to retain humidity in your terrarium. Fire Belly Toads are insectivorous and will need to be offered a variety of insects to stay healthy. Fire Belly Toads should be fed small crickets or mealworms dusted with ReptiCalcium® and ReptiVite™ as directed. 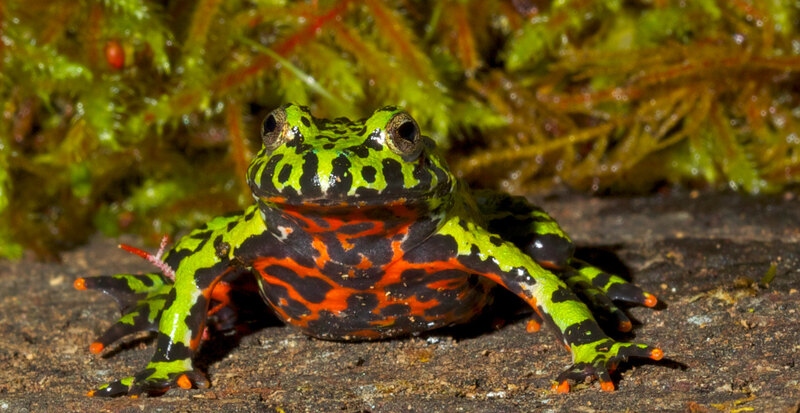 Feed as many insects as your Fire Belly Toad can eat in 15 minutes. Always offer a variety of feeder insects. Small guppies can be offered occasionally. Zoo Med’s Repti-Fogger™, Habba Mist® or Motomister™ can be used to add humidity to the enclosure. Water areas of amphibian enclosures need to be filtered and frequent water changes are recommended. Zoo Med’s 318 Submersible Filter is the perfect choice for small water sections of terrariums. Larger water areas can be filtered with Zoo Med’s 501 Canister Filter.